As our Blessed Mother stood at the foot of the Cross, she would have pondered many moments from the past thirty-three years with her Son. 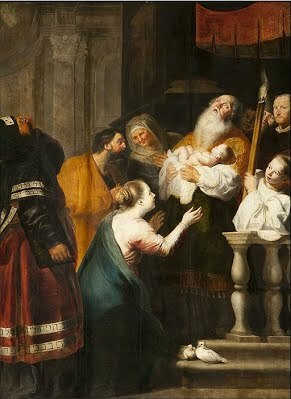 One such moment was when she and Saint Joseph presented Jesus in the temple in accord with the Jewish custom. As they brought their newborn child into the temple they were greeted by Simeon, a holy and righteous man who spent his days praying in the temple. Simeon had received a personal revelation from God that he would be blessed to see the Savior of the World before his own death. The sword of sorrow, prophesied by Simeon some thirty-three years earlier in the temple, at Calvary pierced our Blessed Mother’s heart. The Immaculate Heart of our Blessed Mother was deeply wounded with this promised sword as she stood at the foot of the Cross watching the cruelty befalling her Child. One consolation that she would have received as this sword of sorrow pierced her heart so deeply was the recollection of this prophecy. The prophecy of Simeon would have clearly come to mind in this moment and the truthfulness of Simeon’s words would have helped her to know that the sacrifice of her Son on the Cross was the fulfillment of His mission. Knowing this truth would have eased her pain as she gazed at the completion of the will of God. We, too, are guaranteed various swords of sorrow in our lives. We are promised that if we follow Jesus we will also take up our crosses. We are promised that we will drink the same “cup” that He drank from, endure ridicule just as He did, and be called to give our lives in a sacrificial and total way. Knowing the truth of our calling in life helps us be at peace when the sacrificial aspects of our personal mission come to fruition. Reflect, today, upon two aspects of this scene on Calvary. First, ponder the deeply painful sword of sorrow that our Blessed Mother endured as she stood before the Cross of her Son. Secondly, reflect upon the consolation she would have received as she recalled the words of Simeon the prophet. Pondering those words strengthened her and enabled her to see her Son’s death as the fulfillment of the will of God. In turn, knowing the truth of your mission of sacrificial love will help you as you endure the swords of life. Dear Mother, as you stood before your own divine Son on the Cross, the sword of sorrow prophesied by Simeon pierced your Immaculate Heart. Help me to see the pain in your heart this day. As I gaze upon this wound of love, help me to also see your heart’s acceptance. Dear Mother, may I hear the words of Simeon and accept them into my own life. In this life I am promised the same fate as you and your divine Son. I am promised a life of sacrifice and suffering. But I am also given hope as I see sacrifice as the fulfillment of the will of God. Dear Lord, help me to unite all suffering in life to You. May I accept the crosses I am given with hope, love and joy. May I never shy away from the fulfillment of Your will. I give myself to You, dear Lord, and pray that I may imitate Your total self-gift to the world.